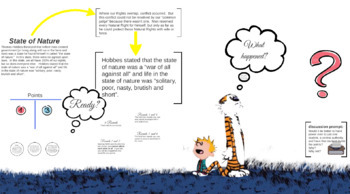 Thomas Hobbes State of Nature Game: Why Government? Students are challenged to distribute "extra credit" points - the catch is whether they received the points depends on how they personally choose to distribute the points. Students must, by secret ballot, choose either: 1 point for everyone, or 3 points for themselves. If three or less students choose 3 points for themselves, then everyone gets 1 point. If MORE than three students choose 3 point for themselves - nobody gets any points. The rules change every 2 rounds (6 total rounds) - students have a love-hate relationships with this game and bates the question of why communication and a governing body can be beneficial. This is similar to game theory or the prisoners dilemma in theory.